Quentin is now living in Fillory. And he is king, or a king, one of four human kings and queens who rule this magical land. 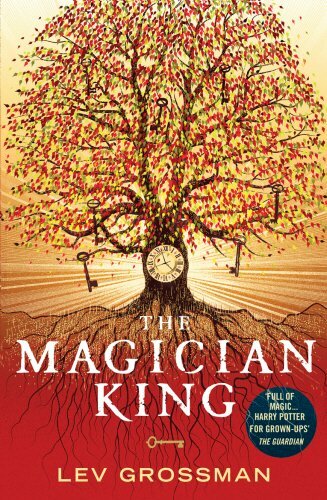 In the first book of ‘The Magicians’ trilogy by Lev Grossman, we saw Quentin accepted at a magical university in New York and finally find his way to Fillory, which he thought was a fictional world from a children’s book. He is living his childhood fantasy, but he is bored. Life is like living in a 20-star hotel and he is getting fat. Then one day, out hunting the Seeing Hare, one of the Unique Beasts of Fillory – this world is full of magical beasts which can talk or have special powers – a new adventure starts. The big difference for me from book one of the trilogy is that the action starts straight away. All the setting-up has been done, the background is in place, Fillory is understood, key characters are established. Most intriguing is the presence of Julia, who was Quentin’s love interest in the non-magical world, briefly at the beginning of the first book. Quentin was offered a place at Brakebills, the magical college. Julia wasn’t. But now she is a magician too. She learned her magic the hard way, in the magical underground in the ordinary world. And she is moody and edgy. She talks to the animals, speaks in an old-fashioned cadence, she dresses in black. She is interesting. I liked Julia. Quentin and Julia set sail on a magical ship, heading for the Outer Island to collect overdue taxes. They end up back in the real world, trapped, and unable to return to Fillory. Of course they manage it in the end, via the underground magic network, trips to Cornwall and Venice, an Australian magician, and a dragon. This book is three quests, one after another. The action is continuous. I saved books two and three to read while on holiday, and read them back –to-back. Click here to read my review of the first book of the trilogy, The Magicians.